To state that Italy is the slow student in the class is an understatement. There’s been a two-decade period with almost no improvement in economic output. Even Greece has done better! 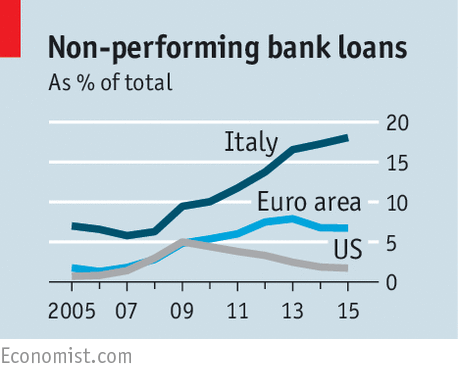 To make matters worse, Italy’s long-run stagnation is matched by an immediate banking crisis. Here are some excerpts from a MarketWatch report. Banks in Italy are weighed by about €360 billion in nonperforming loans, or unpaid debts, according to Italy’s central bank. That represents 18.1% of total loans to consumers. Roughly €210 billion of those loans have been taken out by borrowers now considered to be insolvent. “Meanwhile, average return on equity has been less than 2% per year during the last five years, neither enough to clear out the NPLs at a decent pace, nor to attract more capital. And, as illustrated by this chart from the Economist, this puts the nation in a very undesirable position. There’s also a demographic disaster in Italy. The fertility rate is 1.43, which puts Italy in 208th place out of 224 nations. To be sure, there’s nothing wrong with choosing to have fewer children. The “disaster” is that Italy has a huge, pay-as-you-go entitlement state that is premised on having an ever-growing number of new taxpayers to pay for the promises made to older taxpayers. And since Italy’s population pyramid is turning into a population cylinder, that’s obviously not happening. Indeed, the EU Observer reports that parts of Italy are becoming ghost towns. Around a third of villages in Italy are at risk of turning into “ghost” villages in the next 25 years because young people are leaving, and those who are left behind are dying of old age. …2,430 villages are at risk. The “good news” is that there is some awareness that the nation faces a double-disaster of statism and unfriendly demographics. Unfortunately, that awareness doesn’t extend to Italy’s ruling class. Almost nothing is being done to address the problems of a bloated (and notoriously incompetent) public sector and excessive government intervention. Fully one-half of the nation’s economic output is consumed by a bloated public sector. And a stifling tax burden helps to explain why economic output is stagnant. And I’m not expecting good results from a new scheme to change the nation’s demographic outlook. Italy’s health minister is proposing doubling a ‘baby bonus’ incentive for couples to have more children to combat what she calls a catastrophic decline in the country’s birth rate. …Lorenzin told the paper she wanted to double the standard baby bonus, currently 80 euros ($90) a month…and introduce higher payments for second and subsequent children to encourage bigger families. Part of my concern is that I don’t think the government should pay people to have children, both because I don’t like redistribution and because I’m skeptical that you can successfully bribe people to have more children with $90 per month. But when you dig into the details, the proposal is even more troubling. The government basically wants to encourage more children from the portion of the population that is most likely to rely on state handouts. Higher-income families, those with taxable earnings of more than 25,000 euros per year, are not eligible for the scheme, excluding about a third of parents. The allowances are paid at higher rates for the poorest — those declaring less than 7,000 euros a year to the taxman. Under the new proposals, the payment for second and subsequent children would be 240 euros/month for average families and 400 euros/month for the poorest. 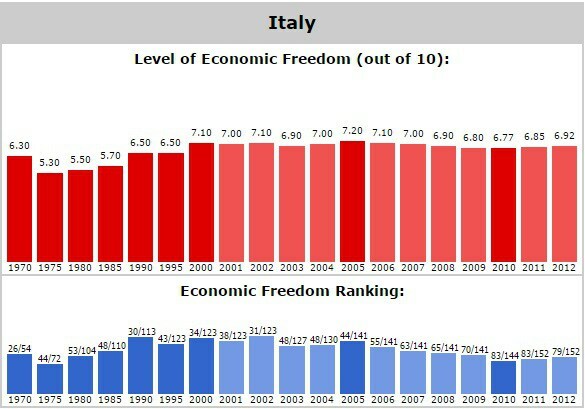 Call me crazy, but the last thing Italy needs is more people riding in the wagon of government dependency. Oh, by the way, this scheme will add to the burden of government spending. Lorenzin’s proposals would add 2.2 billion euros to public spending over six years, her department estimates. More spending, bigger government, higher taxes, and additional red ink. Maybe that’s a recipe for prosperity on some planet in the universe, but it definitely won’t work on Earth. P.S. No wonder there’s discussion in Sardinia on leaving Italy and joining Switzerland. After all, the luckiest Italian people in the world are the ones in Ticino, the southernmost canton of über-prosperous Switzerland (just as the unluckiest French people live in Menton and Roquebrune, which used to be part of Monaco). P.P.S. Though you have to give the Italians credit for ingenuity. This doctor and this cop both went to extraordinary lengths to earn membership in the Bureaucrat Hall of Fame. Seems like a bargain to me. For a mere 5-20k in total subsidies, a woman will produce a half slave who will be forced to prop up the collapsing intergenerational welfare pyramid, by paying 500k in taxes over his/her lifetime — if he/she stays in Italy as a productive person. 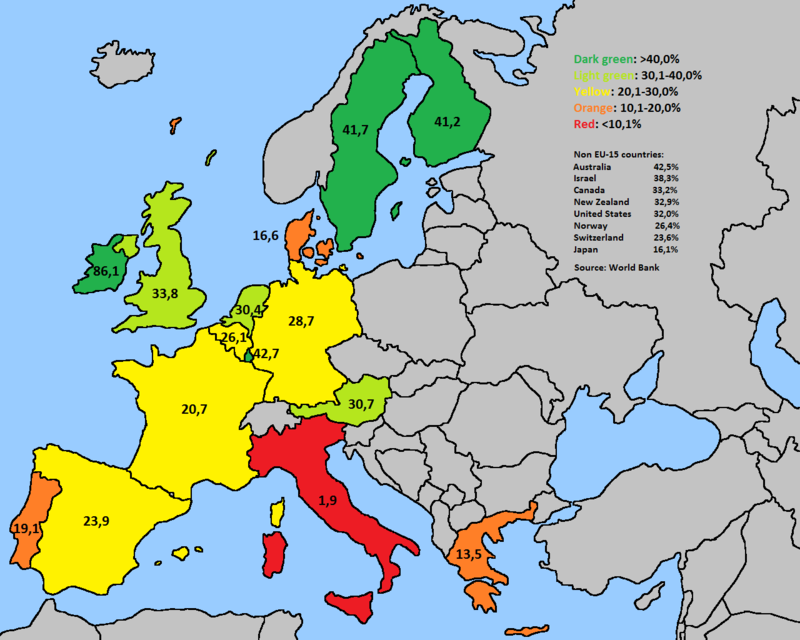 “If you can just cross those 200 Miles of Mediterranean Sea, you will make a lot more money than you ever made in your country by producing welfare babies in Italy — but don’t do it, because it is unethical to live off the higher productivity of other people and nations”, (yes, in spite of their spiraling decline, Italians still produce more than North Africans — at least for now). Perhaps Italians would be very productive people “were the system not rigged against them”? Interestingly, when those same Italian people come to America, the heart of capitalism, the epitome of worker exploitation, where they have fewer employee protections, fewer unconditional welfare benefits, less income tax, less payroll tax, almost no VAT, no punitive taxes on energy, don’t have to live in an eight hundred foot eco-planning-city apartment, … then, mysteriously, these people become productive — and happier overall too! It’s a mystery. Could it be that the rigged system that Italy has is the rigged system that collectivist minded voters dreamed up themselves and implemented? One HopNChange paved the road for the next into an inescapable vicious spiral? Interestingly also how in the HopNChange collectivist paradise called Italy, with all the employee protections, strong unions to shield people from greed, centralized industrial policy set by the people … two thirds of families make less than 28k per year. Are the Italian workers so incompetent in claiming and asserting their rights? There ain’t anything special about Italian people folks. Under the same legislation and incentives, Americans will behave –and vote– the same way. The trendline is becoming rather obvious. Finally I’d like to remind that any nation whose structural per capita output trendline growth does not at least match world average growth — is essentially doomed to a decline trajectory –perhaps not as precipitously fast as Italy — but still decline.